A Story About Potato Chips. I was having dinner with a childhood friend recently and we were discussing his business. He is a potato farmer in rural Florida, about 45 minutes outside the town where we grew up. His farm has been family owned for generations and he is continuing the family tradition, working with his father to continue to sustain and grow the business. My friend specializes in potato chip potatoes. I didn’t even know there were special potatoes for chips! You learn something new everyday! The potatoes range in size from golf ball to baseball. They are also essentially “skinless.” I took a big pause when my friend told me he grows skinless potatoes. The skepticism was written all over my face. I didn’t want to believe it. Chip potatoes aren’t actually skinless, but the skin is so thin, it rubs off in transit from the farm to the Lays factory so they don’t have to peel them. I thought that was pretty cool. But understanding the process of oxidation and how sensitive potatoes are to it, I didn’t get how a skinless potato can be transported via big rig and not change colors; this was, logically, my next question. My friend was happy to oblige my potato inquisition and told me they aren’t on the trucks long enough to oxidize. The potatoes go from farm to truck to fryer within 24 hours. There is a Frito-Lay plant less than 20 minutes away. This satisfied my curiosity for the moment. Next-up in my inquisition was the topic of imperfections in chips. 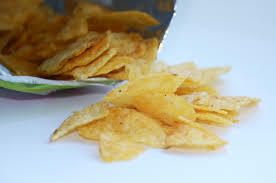 The light brown ring around some of the chips means the sugar content while growing was too high. It won’t hurt you, but it is essentially caramelization of the excess sugars in the particular potato. For the potato guys, this isn’t ideal, but for me, any caramelization is a win! Occasionally, there is a green spot on your chip; this too is harmless. This means the potato got sunburnt after the skin came off, typically on the truck. Who knew?! Christina Hoffeld is a chef and area manager for Denver, Omaha, Chicago, Indianapolis, Milwaukee and Washington D.C markets.